In The Kitchen with Tico: Capturing Global Cuisine with an American Core | Exploring Food & Drink in D.C. Relatively new to U Street is Michael Schlow’s Tico with George Rodrigues in the kitchen as Executive Chef. Walking in, the restaurant definitely fits into the U Street scene, but on the more posh and polished side of things. Designed by David Manfredi of Elkus-Manfredi Architects, Tico boasts a large open space, with an open kitchen view and low lights, and beautiful worn in textured tables. It seems like a small detail, but it immediately made us feel comfortable and eager to try the Spainish, Mexican, and South American inspired menu. To start, our server advised us that the Hibiscus Margarita is a runaway favorite, and we can easily see why. Eye catchingly pink, with 100% Blue Agave Tequila, citron, lime, lemon, this sweet and savory margarita had us wondering if we had encountered such a good margarita in recent times. We also tried the Diamond in The Back, with white rum, lime, green chartreuse and orange bitters. We were surprised at how refreshing this drink was and how the sweetness of the rum carefully balanced out the bitterness of the orange. However, our underdog story here was the Cool Hand Luke, with American Gin, cucumber, mint, lemon, and pink peppercorn. Arriving in a tumbler of vibrant green liquid rimmed with a heavy dose of peppercorn, we were very hesitant to try this green, alien concoction. However, boy were we happy we did. Needless to say, it took all of our stress away. Since we arrived at right at the midst of happy hour, we started our meals with a series of small plates. We ordered the Spicy Watermelon Salad, the Chorizo Risotto, Local Crab Tostada, and the Roasted Cauliflower. As quickly as we put in the order, it seemed that the food started to come out just as quickly. The ascetically pleasing Spicy Watermelon Salad, with red onion, quesco fresco, and Serrano ham, was bursting with color and flavor. Depending on your personal preference, the onion may be a bit over powering in flavor, however, we found the salad a great start to our meal. The Chorizo Risotto with pablano sofrito, green onion, and parmigiano, was very different than what we were expecting. Much more of a chili consistency, with large chucks of roasted peppers, was something we envisioned ourselves eating on a cold winter day, rather than a summery happy hour. However, the risotto was excellently cooked, creamy and smooth, with a slight spicy kick. 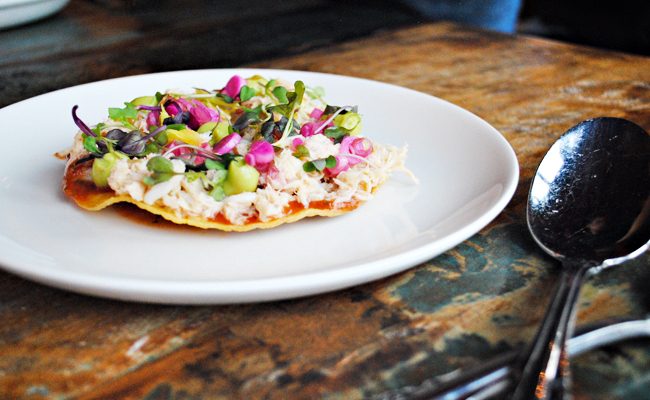 The Local Crab Tostada with smoked avocado, pickled scallions and gazpacho sauce was absolutely one of our favorites. The crab was prepared in such a way that is was fresh however subtly spicy. In contrast, the toastada was extremely crunchy, and overall it was a delicious pairing and a fun dish to eat. Lastly, the Roasted Cauliflower, with its chipotle, crunchy favas, and cotija cheese, completely stole the show. Simply delicious if you are tired of eating the traditional vegetable like roasted broccoli or even a heavy mac n’ cheese, this dish was a refreshing entrée choice, one that we would like to go back and enjoy. While we had ordered 4 plates, we still were hungry. With Tico being mostly a tapas bar, do not expect to be full with just a few shared appetizers. 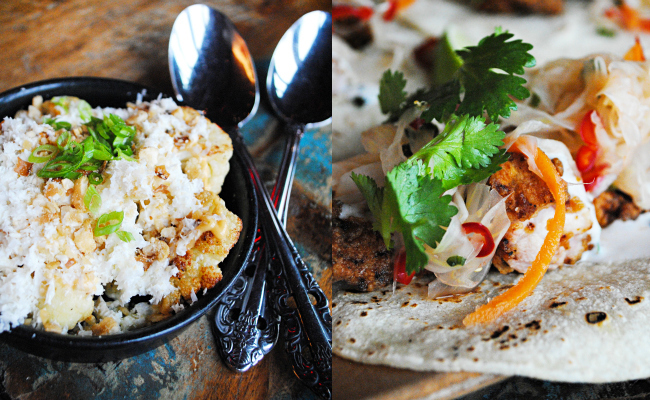 We ordered the Crunchy Fried Chicken Tacos (because, why not try something completely different?) and we were surprised how tender the fried chicken was. Personally, we would have loved a little more spicy buttermilk ranch on my taco, but we can bet our hearts are thankful for the light application. Towards the end, our sweet tooth was calling, and we peeked at the dessert menu in hopes to find something to satisfy our cravings. Thus, we found our way to the Caramelized Banana Split Chocolate Gelato with Peanut Butter Mousse. 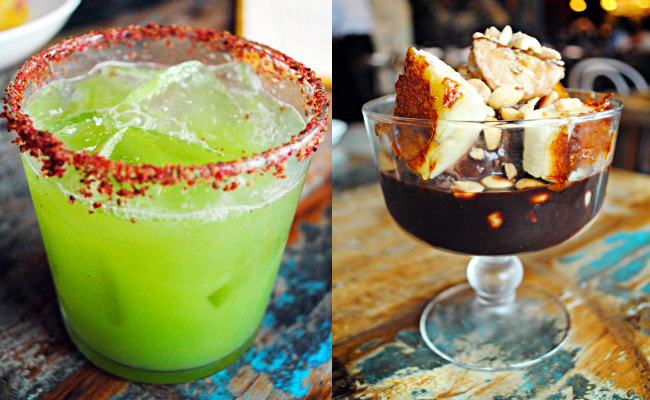 Nothing against the delivery of this dish, it was a plethora of chocolate and bananas, but overall we felt that Tico should stick to what it does best, drinks and tapas. We really enjoyed our experience at TICO, but realize it is a bit pricier than some people may want to spend on small plates. We thought the “Can’t Decide” option, where the kitchen chooses for you, is a great way to experience Tico if you want to try a range of offerings. As Tico playfully lists “Kind of Hungry” is $36 per person, “Forgot to Eat Lunch” is $55 per person, and “ Full on Tico Experience “ is $85 per person. Or you can just join me in the back where I’ll be ordering Cool Hand Lukes with a the Roasted Cauliflower for the rest of the night. *All Photos by Ata Z. Tags: cocktails, David Manfredi, Elkus-Manfredi Architects, Michael Schlow, Tapas, Tico, U Street. Bookmark the permalink. You seriously eat at the awesomest restaurants. I would LOVE to eat here. That Crab Tostada looks delicious!! I think I’d be on the same page you were with that roasted cauli. It all sounds pretty dang incredible though. You are so lucky getting to eat some where so good! I haven’t been to a nice restaurant in I don’t know how long! The food sounds amazing. I would be willing to try the crab taco because it looks so fresh and tasty! I haven’t actually ever tried crab if that tells you anything. Roasted cauliflower sounds interesting too. We had a tasty sweet and sour cauliflower awhile back and I have been craving that. I wonder if the roasted cauliflower would do the trick? This looks like a restaurant we would visit regularly for date nights if we lived in the area. I love small plate places so we can try a variety of things! This sounds like an amazing restaurant. I would love to try that banana split gelato. I would love, I mean LOVE to try that Crab Toastada! All of the food at Tico looks amazing. Love crab! The crab tosada sounds right up my alley! OMG! There is not one thing here that doesn’t sound absolutely amazing! Ooo I want that Crab Tostada. Looks yummy! I am in Richmond, might have to swing by next time I visit DC. Wow, everything sounds amazing… YUMMY… I really would love to try the Roasted Cauliflower… sounds delicious. I would love Crunchy Fried Chicken Tacos! Yum! 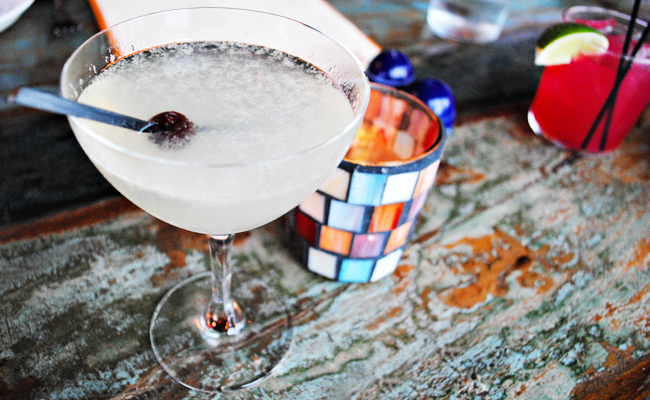 Cool Hand Luke, now that’s a drink worth trying out. This food looks delicious. I think a crab taco sounds tasty. This is getting to be one of my favorite blogs. I want to sit at the table of this chef and be woo’d. I like the look of everything. Wow, that hibiscus margarita sounds out of this world! This all looks so amazing. And I would love to try that dessert, oh my! Heading to D.C soon. Will have to try Tico out! The Chorizo risotto sounds delicious! Listen, I live near DC, can I PLEASE come with you! You always eat at the most amazing places!